MAY is a month which historically heralds the start of the summer season workers enjoying two extra days off this month. The first additional holiday is the May Bank Holiday traditionally falls on May 1st, known as May Day (this year six days later on Monday, May 7th). The second day off is at the end of the month, this year falling on Monday, May 28th. So why are there two Bank Holidays in May? In 2011, Parliament debated moving the second May Bank Holiday to a date in October but these plans were scrapped. This means that workers can enjoy ten days off in May thanks to two normal weekends and two three-day breaks. Three-day weekends have been a part of modern British culture for decades, with May Day becoming an official Bank Holiday in England in 1978. However, the roots of these summertime holidays reach far further back in history. May 1st has been a traditional spring festival across vast swathes of the northern hemisphere for centuries, with ancient cultures celebrating the end of the long winter and the start of summer with joyful song and dance. The earliest recorded May Day celebrations appeared in the Roman Republic era sometime between 509 BC and 27 BC, with the masters of the classical age paying homage to Flora, the Roman goddess of flowers. In the Pagan calendar, the festival was known as Beltane, most commonly held at the end of April to celebrate the first day of summer. The ‘Beltane Bash’ music festival, previously held in Webheath, Redditch, is now held in Preston Bagot, Warwickshire. In 1871, the Bank Holidays Act was introduced in Britain, ensuring four days of the year would be treated as public holidays. These initial holidays were Easter Monday, Whit Monday, the first Monday in August, and Boxing Day. The second May Bank Holiday - also known as Spring Bank Holiday - started off life as the Monday after Pentecost - also known as Whitsun or Whit Monday. It became associated with International Workers’ Day back in 1890 when it was used by protestors to support the introduction of an eight-hour working day. It was permanently moved to its current position at the end of the month in 1971 following a five-year trial period running between 1965 and 1970. So, what are you going to do with these additional ten days off in May? You may want to prepare your garden for BBQ season and make some purchases for home and garden. Perhaps you require garden accessories and garden furniture? If so, there is no better place to make these purchases than from Brilliant Wall Art. 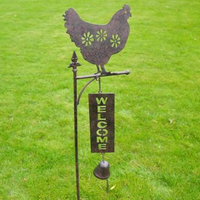 We provide a variety of garden decorations and accessories, perhaps you require an outdoor key holder or a boot brush scraper to ensure access to your home remains safe and clean, or maybe you are looking to add movement to your landscape with our garden wind spinners, each decorated in a different style reflecting nature. A garden sculpture or garden planters may add that finishing touch to complete your outdoor retreat. No outdoor lifestyle is complete without a few decorative touches. We also showcase a variety of garden furniture, chairs, benches and tables; some of which is styled on the traditional French aged design, shabby chic and rustic distressed. If you would like to find out more about our outdoor garden decorations, garden furniture and garden accessories, simply browse throughout our creative range upon our website. At Brilliant Wall Art, we specialise in high-quality wall art, including metal wall art. We are continually striving to offer the very best in products and customer service. Check back on a regular basis as we are always searching for new products to offer our customers at the lowest possible prices. No other store is as committed as we are to the satisfaction of our customers, and therefore we will continue to offer the very best products at affordable prices. Want to view before you buy in May? Why not enjoy a great family day out at the RHS Malvern Spring Festival (10th to 13th May 2018). Karen from Brilliant Wall Art will be attending the festival at the Malvern Three Counties Showground, with the extensive and continually expanding range of wall art home and garden accessories. Check out stall (no. 2012) for extra special festival offers exclusively for you. NB: If you see the same product advertised at a lower price including delivery and in stock we will endeavour to match the price and where possible beat it. Simply contact our team with details of the store or website that you have seen the product(s) at a cheaper price and let us do the rest. Enjoy your purchases, get your BBQ out and have fun during your 10 days freedom in May.